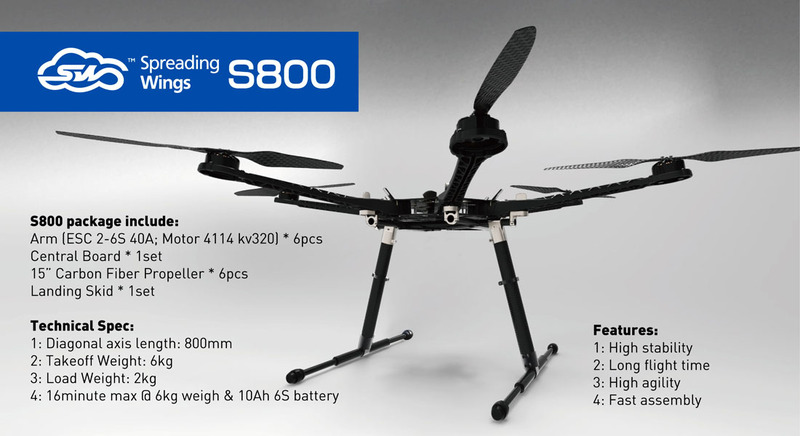 The "SPREADING WINGS S800" is DJI's latest "Hex-Rotor" platform. The frame is large measuring 800mm diagonally. The injection-molded arms disassemble & reassemble quickly and easily. It features a high-efficiency, dynamic control system that provides an unusually high degree of stability. It is designed specifically to integrate with all of DJI's product line. It is the best possible choice for a wide range of aerial photography applications.